This hair washing tray is exceptionally easy to use. It is contoured to fit the neck comfortably and rest on the clients shoulders for convenient shampooing in a seated position. Designed to be used with a chair or a wheelchair. The EZ-SHAMPOO Hair Washing Tray is made of durable plastic and designed for years of trouble-free use. 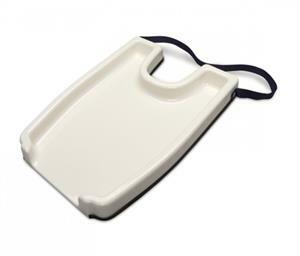 Features include compact and lightweight reducing awkward lifting and bending for the caregiver, a 35" stabilizing strap, a unique rubber facing surrounding the tray and neck opening to provide superior comfort and prevent slipping, raised edge prevents water from spilling over, and easily cleansed with a mild soap and water.